When I was growing up in the 1970’s, I had owned at least three watches between ages 6-12. The first watch was an analog watch (with hands) depicting a picture of the moon and space on the face and an astronaut tethered to a Mercury space capsule as an animated sweep second hand. My second watch was a hand-me-down from my father and was a basic analog watch with a silver toned case and blue face. It wasn’t that memorable. The most memorable early watch I ever owned was a digital watch made by Texas Instruments (aka TI)… and when I got it for Christmas, I was living in the FUTURE!!! The watch was part of TI’s TI-500 line of LED digital watches. The guts of the watches were the same in this line, but the case stylings were different. TI produced a square black plastic case with a large round dark red lens that nearly filled the case surface area. There was another model with a similar design and shape, but the lens wasn’t round. The lens was a smaller rounded rectangle, but still took up a good portion of the surface area of the watch face. Although LED watches of the day were futuristic enough as is, The version I got is one that I think could be considered the MOST futuristic looking watch of the TI-500 line. It had a narrow dark red lens which sat squarely in the middle of a “stacked trapezoid” case. The narrow lens kind of appeared like a space robot’s visor, not unlike the Cylons on Battlestar Galactica (what can I say, it was my “kid imagination” thinking for me at the time). The picture shown here is not the actual watch I got for a Christmas gift, but an excellent condition replacement I won on eBay which has survived quite well over its years before I acquired it. This one has the standard “brushed” metal lower third part of the watch face. There were some specialty versions of this watch which had printed pictures, like race cars, on that brushed area. The case is shiny and textured black plastic with equally spaced ribbing going along the wristband in two directions; from below the brushed metal, and above the red lens. In fact, the top third of the case seamlessly blends into the band. The battery cover is only textured, but made from the same plastic, coated onto a metal disc. Under the battery cover, you would install two LR44 watch batteries which will give you about 30-45 days provided you don’t keep pressing its shiny button(s) all day long. A watch like this did not display the time continuously. It would have drained the battery in days, if not hours. LED displays weren’t very efficient back then (and not so much better now). To view the time, you would press a silver colored button which sticks out on the upper right side of the watch body. Pressing it once displays the time for about one second, then it shuts off. You can hold the button in for it to display longer, and then after a few seconds, it will switch to display the actual seconds counting up. Press the button twice, and it will show you the day in MM/DD format. It does not track the current year. It also does not track daylight savings time. You will need to manually roll the hour forward or back depending on the season. The only other button on the watch is recessed in the watch body on the lower right side. Use a pen or pencil to press it and you can set the time and date through a series of button pushes. You can even “synchronize” the number of seconds, like the way I did every morning coming to school and synchronizing it with the clock on the school’s bell system. I knew down to the SECOND when the class ending bell was going to ring! Between 1978 and 2013 (when I got this replacement), something happened to me… I got OLDER! Not only that, I got BIGGER. Back in 1978, the band on this model watch fit cleanly around my wrist so well that the loose end of the watch band would stick out quite far from the fastener. Today, I’m lucky to make the latch fit in the last provided hole at the end of the band. I don’t consider my wrist excessively large. I can go into a jewelry store today and buy any of the modern watches they have there and they would generally fit me as is. I just think the band on the TI watch was designed with kids as the primary consumer, and not adults. All that said, this style watch was a first in my life when it came to digital watches. Yet it was the only LED watch I would ever own for the longest time. LCD based watches soon came on the scene in the late 70’s and I would nearly spend the rest of my life purchasing “cool” digital watches as manufacturers came out with more futuristic features. 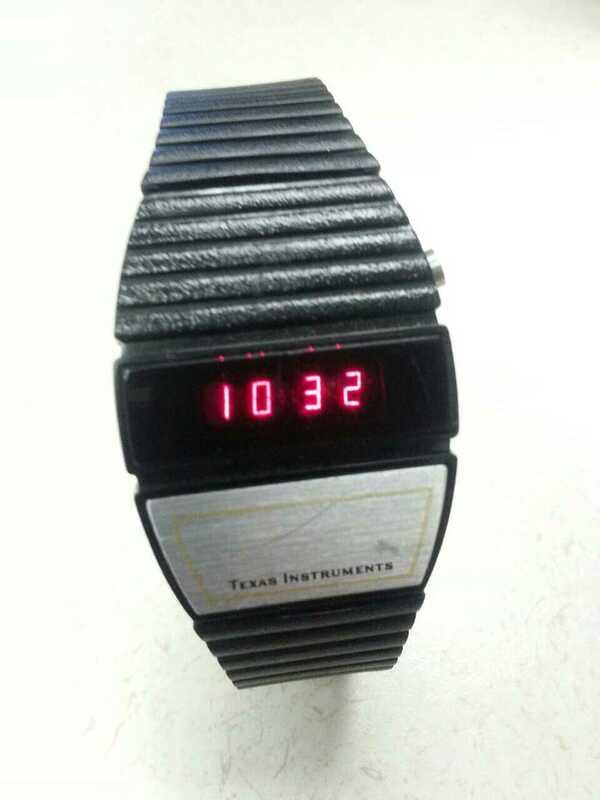 12 Comments to "Throwback Thursday – Texas Instruments LED Watch – 1978"
Did you ever find one? I have my original one in excellent condition and in original case (I’m not sure I ever actually wore it). I may be willing to part with it. Shawn, if your price is right, I may just consider your offer. 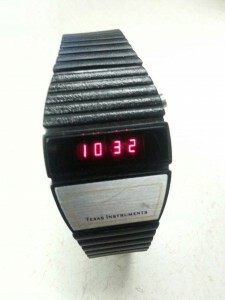 This is very rare Texas Instrument LED watch, it highly collectible timepiece in these days. I still wear mine when I go to “80’s parties” and such. Hi – I’ve been on a nostalgia kick, thinking about how tech things “used to be”, and through the courtesy of today’s tech (google!) found your post here and thoroughly enjoyed reading it. I received the round faced version of the TI-500 as a gift in 1977 (as I recall) and loved it just like you did throughout those days when I imagined myself living in the worlds of Star Trek, Space:1999, Star Wars, Close Encounters, Battlestar Galactica. . .
Today, we have tablets that are very close in design to the Star Trek PADDs. LEDs themselves are having a resurgence, with even more colors! Yet, nobody has recreated the tiny LED elements in the seven-segment displays of those old watches and calculators. If we want to revisit them, we still need to find old, working units. The closest I saw to recreating LED elements is the remake of the Mattel handheld sport games like football, basketball, etc. However, those are actually backlit LCD displays. They look OK, but they can never replace an LED like the original. Enjoy your nostalgia kick, Miguel. I feed my nostalgia for vintage electronic items by going to flea markets and antique stores. You’d be surprised what you may find at those places. Hi there. Wonder if you can help. I have an early LED Ingersoll watch which uses the TI module. I can set the time and the date of the month but can’t find how to set or display the day or the month. Any ideas? For the TI watches, you press and hold the indented button for a second or two and it’ll start flashing the seconds. You can zero that value with the main button. Then each time you press the indented button afterwards, you can adjust the remaining values in the following order using the main button: hour, minute, month, date. The TI only had those two buttons. I don’t know if the Ingersoll uses any more buttons. I had one of these for my birthday when I was 11 I think. I’m 48yrs now. I’ve never forgotten it as it blew my mind – best present ever!. This last weekend I went to stay with my parents to celebrate my dad’s 70th Birthday and found my old watch on the floor in the garage. He’d been having a clear out but not noticed it surface. I’m off to the jewelers this afternoon to see if it still works. It would be great to see if it still does work. My husband has the Texas Instrument T1 3H Wrist Watch.